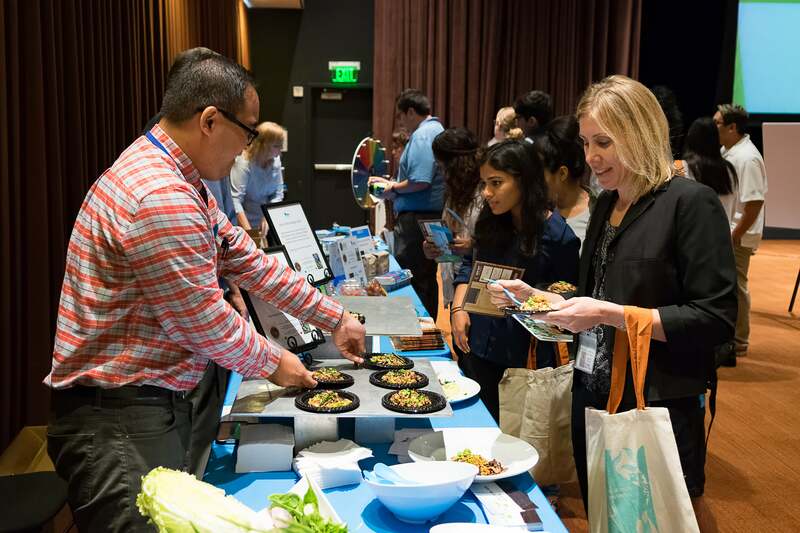 The Sixth Annual Sustainable Food Expo was hosted at Price Center on Monday. The event, which aims to gather like-minded groups and individuals dedicated to sustainable food and healthy living, included a variety of organizations and departments from around campus. The theme of this year’s expo was “toward a greener diet”, which was reflected by the focus on healthy and sustainable eating habits and the timing of the event on Food Day, a nationwide celebration and a movement toward more healthy, affordable and sustainable food. The activities of the expo ranged from presentations of academic research in agriculture, food security and microbial systems, to campus resources such as community gardens and student organizations, to cooking demonstrations by HDH and the Center for Integrative Medicine. Muir College senior Ismael Ramirez got involved with the expo through his role as the sustainability coordinator under Hugh Hagues, the assistant director of retail operations for University Centers. Ramirez started learning about the importance of sustainable food as a freshman through student organizations and the community gardens. Since then, has become more involved in sustainable and healthy food issues and activism throughout his college career. He wanted the expo to convey the impact that eating has and how being more thoughtful about our everyday actions can have a large effect on the environment and people around us. One of the participating booths at the expo was the Food Recovery Network at UCSD. It is a community service-based student organization centered on sustainability and social justice that works to recover food that would otherwise be considered trash and go into landfills from various on-campus food vendors such as the weekly Farmer’s Markets, various dining halls and soon, the Faculty Club. FRN’s Public Affairs Officer Natalia Herret emphasized the importance of having these kinds of expos, not only for the organization but for the general education of the public. She also linked the conversation to the larger picture of why events like the expo are important to not only to start the conversation, but start a shift in our mindset about food.